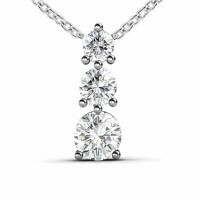 Our collection of diamond pendants for women includes original and unique necklace designs that shine with an elegant brilliance. 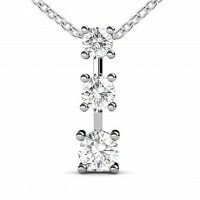 The perfect display of affection is signified by one of our diamond pendants crafted with top quality round and princess cut diamonds. 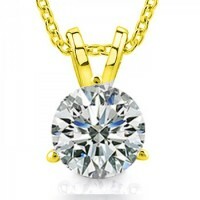 Choose from white, rose, or yellow gold - or customize your order by choosing colored diamonds. 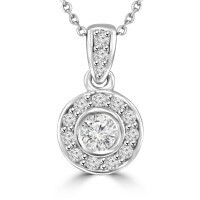 This item is a new certified 0.41 ct white diamond pendant set in 14k white gold. 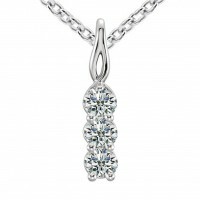 All of these diamo..
A round cut diamond is set in an 14 kt white gold prong setting. 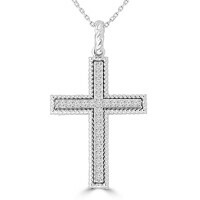 The white metal enhances the qualit..
A shining display of your faith, our diamond accented cross pendant in 14 kt yellow gold is a sight ..
A round cut diamond is set in an 14 kt yellow gold three-prong setting. The white metal enhance..